Ho Ho Ho – It’s Gingerbread Time! I know I’m silly, but I spend the whole year looking at my Christmas cookie cutters: the gingerbread man, the reindeer, the tree, the snow flakes… well, all Santa’s GANG. And I sigh, thinking how much time there’s gonna be till I’ll get to use them again. When november comes, I just can’t help myself, and go straight to the kitchen to make gingerbread. This is my Christmas tradition, so this is a perfect entry for the Flavor of the Month theme, which is… Traditions! In a large bowl, sift together flour, baking soda, ginger, cinnamon, cloves, nutmeg and salt. Set aside. In the electric mixer, beat butter and sugar until light and fluffy. Add egg and beat well, about one minute. Add molasses and honey and mix on low-speed, just to combine. Add flour mixture and mix until all the flour is incorporated. Divide the batter in two and wrap in plastic. Refrigerate for at least one hour. Preheat oven to 180°C/ 350°F. On a floured surface, roll out dough to 1/4 inch thick, and cut out using cookie cutters or a template for gingerbread house (this one from Martha Stewart is very pretty). Transfer the cookies to a parchment-lined baking sheet, and freeze for 15 minutes. Bake until firm but not darkened (the time will depend on the cookie sizes). Transfer to a wire rack to cool before decorating. 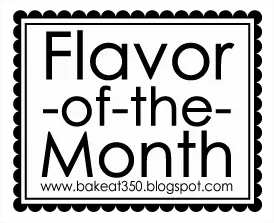 For a really good royal icing recipe and step-by-step, check Bridget’s website, Bake at 350°, then you can see the other Flavor of the Month entries too. LOVE your soundtrack! LOVE your gingerbread!!! I have been itching to make some and your men and reindeer and houses are positively charming! MMMMMMMMMM,….your ginger bread man & woman look awesomely delicious!! I also love your ginger bread houses! Real beauties!! You have a COOL foodblog! Excellent pictures as well! Ohhh I love the gingerbread man with the tie, very official! Favorite part of the holidays is the Gingerbread men! Thank you for sharing this recipe, I am going to try this out. Nice pictures…I like the guy with the suspenders, very sharp look. Oh my goodness, can you teach me to make gingerbread men and houses like you? I love your little gingerbread houses. My siblings and I always make one big house, but this year, we’re contemplating making multiple, smaller houses! My sweet tooth is jumping. Love your gingerbread man but what has me salivating is those homes. They are beautiful. hahaahaaa. . Awesome & beautiful! Ooh, I love the idea of a honey gingerbread cookie! I wish I had the time to make all these great cookies I’ve been seing online lately! Your ginger bread houses are amazing – they are so pretty! 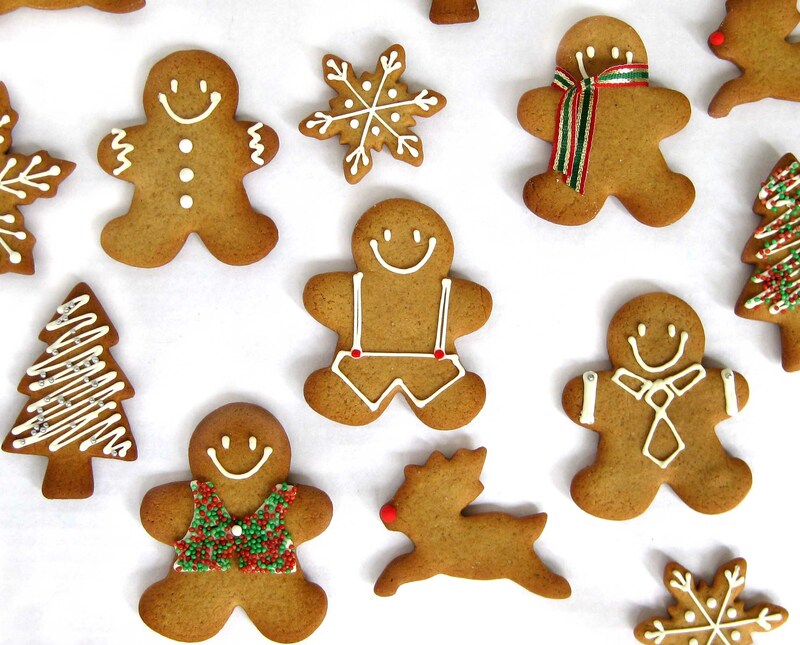 The little gingerbread men are adorable and delicious: I love this Christmas tradition! There’s a link to a measurement conversion calculator on the right side bar, teenagegeek! I hope it helps! I’m a sucker for food posts. Just wish the hubs would build a gingerbread house with me. 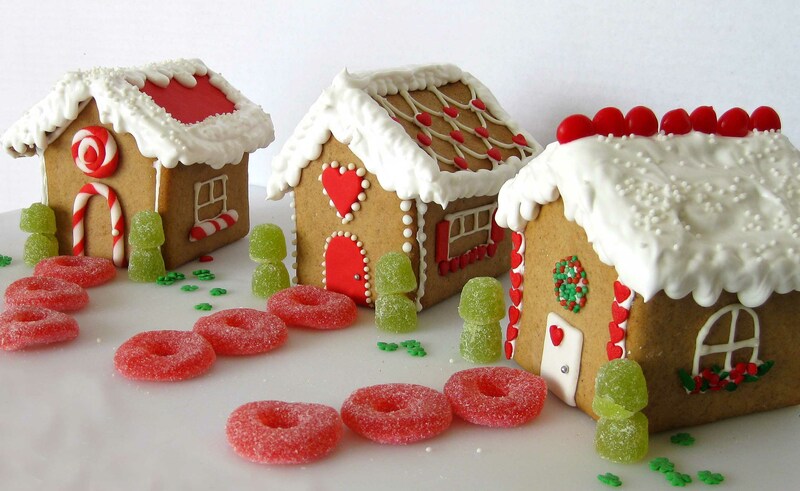 Oh wow, the gingerbread cookies and house looks fantastic. I too am toying with the idea of whether to make gingerbread this year as well …. I’m still thinking! I always loved gingerbread houses as a kid…Actually, I still do! An instant demolition might be hard to watch after all that work! hey P. how have you been? ur village looks amazing! when can move in? I love ur recipe and I will attempt making some cookies! I just found your blog and am enjoying reading it. I am intrigued by the addition of honey to this recipe. I made gingerbread men every Christmas but my recipe does not call for the honey. I will definitely be trying it next time! These make great place cards at the holiday table after piping names on them. Along with neckties for men and holly for women.